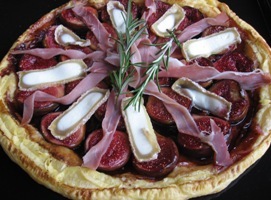 Bordeaux wine is known worldwide, but what about the Food and Cuisine of Bordeaux? Is it a match for the fine wines? 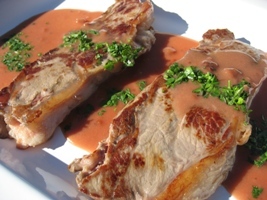 With its Atlantic ocean coastline, fish and shellfish abound, but Bordeaux is carnivore country and its most celebrated dish is entrecôte marchand de vin, also called entrecote a la bordelaise, a world-renowned dish of rib steak cooked in a rich gravy made from Bordeaux wine, butter, shallots, herbs and bone marrow. Certainly a great match with a hearty Bordeaux red. And you are going to find excellent hams, tasty succulent lamb, terrines and pates that will surprise and desserts and cheeses that are in a class of their own. So let's pour a glass and start doing some serious wine and food matching in Bordeaux. 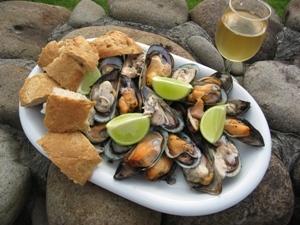 When it comes to shellfish, the region has outstanding mussels, oysters, shrimps, crabs, cockles, clams, whelks, scallops and a lot more. Try a plateau de fruits de mer, a plate of mixed cold shellfish or seafood, then move on to a merrine, a terrine of lobster, cod or scallops. 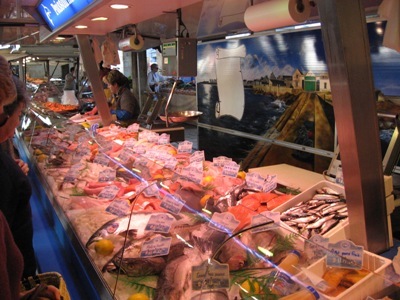 You will find a huge range of fish including ray, cod, hake and eels. But if it is beef you have come for then indulge in the region's signature dish,entrecôte marchand de vin, or if you want to try the best, boeuf Bazadais, beef raised near Bazas. 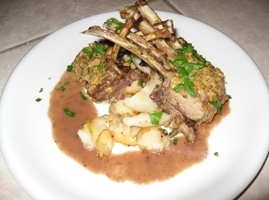 Lamb lovers will enjoy agneau de Pauillac, meat from lambs raised on the salt marshes round Pauillac, and often served with truffles, or try mijote d'agneau aux mojettes, lamb cooked with white beans. 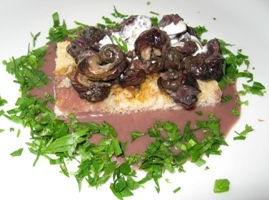 Snails are popular and are often served in a casserole with wine, tomatoes and cognac. Sweet treats include cannelles, caramelised brioche-style pastries, and the famous marrons glacés, candied chestnuts or noisettines du Medoc, roasted hazelnuts rolled in sugar. 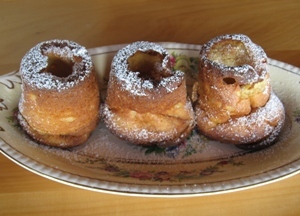 The traditional Bordeaux specialty cake or pastry is the chewy, sweet cannelle, which is really a caramelised brioche-like pastry - and somewhat difficult to make! The French love of food is known universally and if you are looking for real fish and shellfish prepared in a traditional manner follow Rick Stein’s advice and look no further than a village restaurant filled with locals - you will not go wrong. Soak the plank for one hour. Set up on the beach on rocks and make level. Knock on 4 nails approximately 25 mm apart on a square. Take 4 larger mussels and place between the nails with the hinge end up and the convex side facing outwards. Between each of the 4 mussels place 4 more mussels and using the larger mussels first work gradually outwards forming a large rosette. 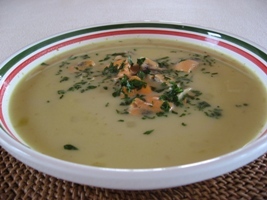 Carefully cover the mussels with a 130 mm thick layer of pine needles. 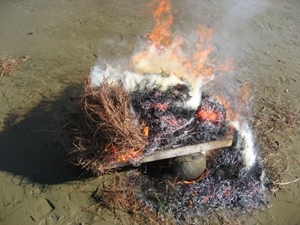 Set fire to the needles in various places and leave to burn - it should take about 5 minutes.. Fan away the ashes and douse with a bucket of seawater. 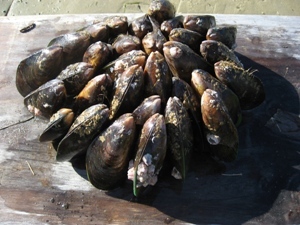 Discard any mussels that have not opened. 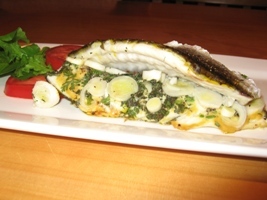 Transfer to plates and eat with lots of French bread and chilled wine. Don't be tempted to build a bigger heap of pine needles - 150 mm is max!